Tanning takes place in the skin’s outermost layer, the epidermis. About five percent of the cells in your epidermis are special cells called melanocytes. When exposed to ultraviolet B light (short wave ultraviolet), melanocytes produce melanin-the pigment which is ultimately responsible for your tan. The pinkish melanin travels up through the epidermis and is absorbed by other skin cells. 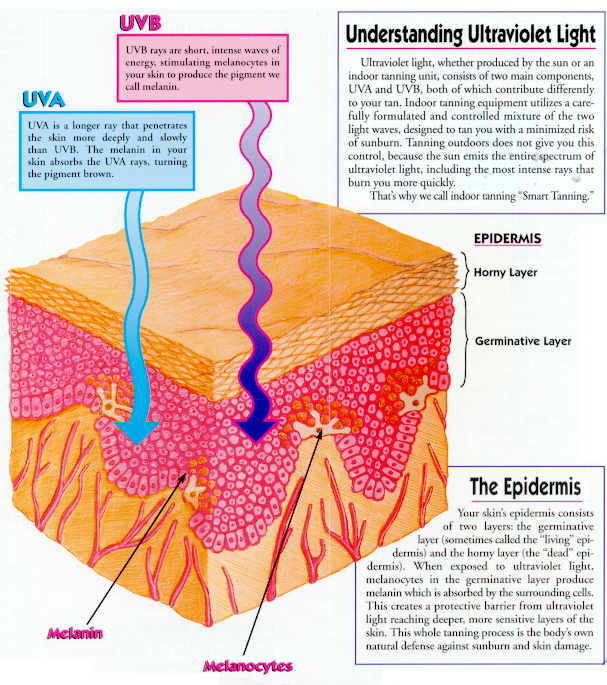 When exposed to ultraviolet A light (longer wave), the melanin oxidizes or darkens. This darkening is your skin’s way of protecting itself against too much UV light. Everyone has the same number of melanocytes in their body – about five million. But your heredity dictates how much melanin your body’s melanocytes naturally will produce. For example, the skin of African-Americans contains enough melanin to create a black or brown skin color, while the skin of Caucasians has less melanin and is pale. In order to most effectively avoid overexposure, a tan should be acquired gradually, according to the guidelines prescribed by your salon professional. A sunburn, or erythema, occurs when too much ultraviolet light reaches the skin and disrupts the tiny blood vessels near the skin’s surface. Why does a tan fade? Cells in the epidermis’ getinitiative layer (also called the living epidermis) are constantly reproducing and pushing older cells upward toward the horny layer (dead epidermis), where they are sloughed off in about one month. As your skin replaces its cells, the cells laden with melanin are removed. So the tanning process must continue with the new cells.